The spine is composed of twenty-four vertebrae, the sacrum and the coccyx. A beautiful architectural construct of complimentary curves: cervical, thoracic, lumbar, sacral and coccyx. The cervical spine contains seven vertebrae; the thoracic contains twelve and is attached to twelve pairs of ribs; the lumbar contains five. 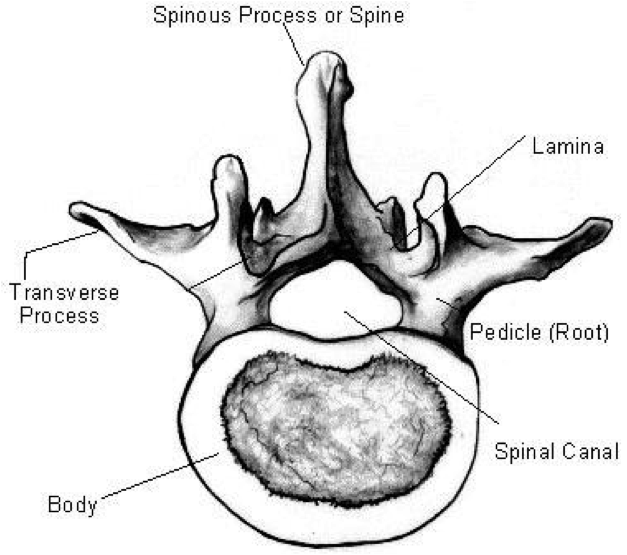 The sacrum consists of five fused vertebrae. And the coccyx is made of an average of four tiny vertebrae. While each vertebra is unique, there are some key features to know. In viewing the vertebra above, let’s first orient you spatially. The top of the picture is the back of the body where the spinous process protrude to the back of the body. The bottom of the diagram is toward the front of the body. This is where the bodies of the vertebra and vertebral discs stack upon one another in the center of the body. The hole in the middle is the spinal canal which houses the spinal cord. And sticking out to each side are the transverse processes. The ribs attach to the transverse process and body of their respective thoracic vertebra. 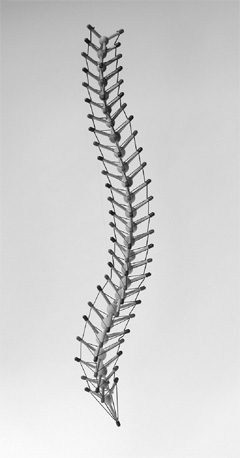 Like a tensegrity sculpture, the spine functions as a balance of suspension (soft tissue) and compressive forces (bones) – see Kennith Snelson’s sculptures. We are born with a C-curve of our spine; this is our primary curve. As we learn to lift our head, we develop the secondary curve of the neck. And as we crawl and eventually learn to stand and walk, we develop the secondary curve of the low back. These curves serve to bring us upright and absorb compressive shock as we walk, jump and run. Increasing or flattening our curves usually results in pain and discomfort. For yoga, it is important to understand and cultivate neutral spine. There are six movements of the spine, two for each spatial plane, flexion, extension, lateral flexion to the right and left, and rotation to the right and left. When practicing and planning classes, warm the spine by moving in all directions. Find a partner who can help you find neutral spine in table. While keeping all of your neutral curves, you want to feel the crown of your head reaching forward and your coccyx reaching backward away from each other with as much length as you can find. Instead of tucking your tail to feel your abdominals engage, try pressing your ankles into the ground. If your upper back is rounded, try correcting the position of your head and push into your hands without rounding your spine. Let your collar bones be wide. Once you’ve found a working neutral, begin to glide headwards as far as you can go before arching into up dog. Then pull tailwards, folding at the hips, as far as you can go without rounding. Really study your neutral range. From there try to find neutral in all of your poses and make a mental log of the one’s that simply cannot be done with a neutral spine. Begin to think of your spine not as a rigid pole, but as one long turgid, but flexible tube. After exploring neutral spine, still in table, shift tailwards as far as you can go before rounding and then consciously let yourself round. Let it travel bone by bone through your spine allowing the arc travel the full distance. Notice, with the help of your partner, if one part of your spine bares more of the arc than another part. If so, this will be a place where you experience more pain, sensation, discomfort. Rewind, and see if you can spread the curve out over the whole spine and if you cannot, don’t go as deep into the pose. Do the same in the other direction. Pass back through neutral from child’s. Shift headwards until you can keep neutral no longer. Then consciously let yourself arc, bone by bone keeping the support of the front body. Allow the arc to spread through the length of your spine. If you feel pain or discomfort, rewind. Notice if that part of your spine is baring more of the arc. Continue practicing allowing the spine to be mostly neutral. And when you choose to veer away from neutral, first let it be conscious and then consciously let the arc or twist travel through the full length from head to tail. Wonderfully written, thanks for sharing! Just a note: Isn’t it the thoracic spine that attaches to the rib cage – not the lumbar? Ah, good catch. Thank you for the correction! I have made the change.